I swear I don't eat fast good that often. But...I did it again. After seeing how popular my post about the Texas 2 Burger was, I decided that I owed it to you...nay, to myself to try the Miami Burger, as well. Let's get down to brass tacks. I've "talked" to some people online who have claimed to have received perfectly nice-looking burgers at McDonalds. I'd like to know where they're going. This time I went to a completely different restaurant. Several towns away, as a matter of fact. Yet my Miami Burger still looked like it was slapped together in 5 seconds (which it probably was). Above is a candid shot of the burger just kind of hanging out. Here's a more intimate photo of what's under the hood. 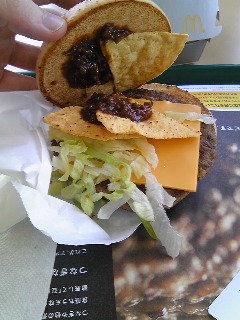 Looks like a dab of chili-type sauce on top of three nacho chips, a Kraft single, and some shredded lettuce. Fortunately it tasted a lot better than it looked. The chili-ish sauce plus the nachos gave me the sensation of eating a taco wrapped in a burger, which wasn't entirely unpleasant. Actually reminded me of a Taco Bell double-decker taco. I was really thirsty after eating it, though. So much so that although I was curious about the nutrition facts, I was too scared to look at them, fearing that I had just consumed about two days worth of sodium. I think this one's finished now, but who knows...maybe it'll be back for Big America 3? That's it. I'm taking you to a quality McDonald's. 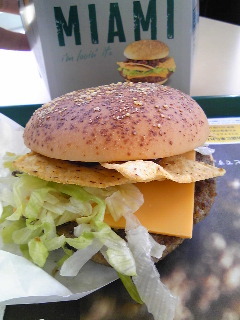 All my Big Macs look like the picture. I never knew it was "brass tacks". I thought it was "brass tax". You learn something new everyday. Deal. Let's check out the next one in March at your special McDonalds! Yeah, there are plenty of those expressions I've been surprised by when finally seen in writing. "Toe the line" was one for me...always thought it was "tow the line." I broke my no-carb diet for this. I still like the 1st Big America series the best but I grew up near a Mickey D's so I'm just reliving my grade school years everytime I visit. Quarter Pounder with cheese is still my main squeeze. I admire anyone who can commit to a diet - tough stuff. Quarter Pounder, aye? I've always been a Big Mac guy myself, but pick your poison, I guess. Like hell. We're going there soon.